Netflix Buys Rights To Stream Chinese Sci-Fi Blockbuster 'The Wandering Earth' The film's release has been a major event in China. Will overseas audiences be charmed by its big-budget special effects, too? The Wandering Earth has rocketed to second place on China's all-time box office list. A poster for the film is seen in the Chinese city of Yichang earlier this month. 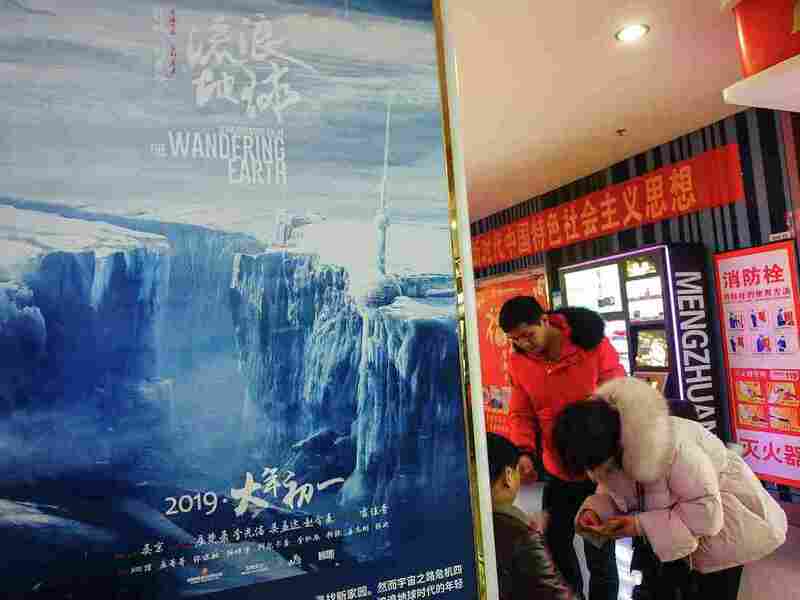 The movie The Wandering Earth has already grossed more than $600 million globally since it was released in theaters Feb. 5. If you haven't seen the sci-fi disaster epic yet, that might be because it was made in China. There, the movie's release has been a major event, and the film has already hit number two in the all-time Chinese box office rankings. The movie has also made $3.8 million in limited release in North America, where it could soon get a lot more viewers: Netflix announced this week that it has acquired the rights to stream the film. Netflix will make Wandering Earth available in the more than 190 countries where it offers service – but not in China, where Netflix isn't available. The movie will be translated into 28 languages, but Netflix did not set a date for its online release. The movie is set in a distant future in which the earth is about to be devoured by the sun. Using propulsive engines, humans turn earth into a spaceship and try to launch it out of the solar system. It stars Wu Jing, an actor, director, and martial artist who has been dubbed "China's Rambo." The film is based on a short story by Liu Cixin, who worked as an engineer at a power plant while writing his books. "This is a movie created for the Chinese audience around the world, and it has been positively received since its premiere, we are very excited about it," the movie's director, Frant Gwo, said in the Netflix press release. "To my surprise, this movie also resonate outside Mainland China." For China's film industry, the release marks a major milestone. "Filmmakers in China see science fiction as a holy grail," Raymond Zhou, an independent critic, told The New York Times. "It's like the coming-of-age of the industry." The Chinese government has been talking the movie up, too. "This film represents a big step forward for Chinese production capabilities and our ability to create global appeal," Lou Xiaoxi, Vice Chairman of Beijing Culture, told Xinhua. So how entertaining is The Wandering Earth? Thus far it's garnered a 67 percent from critics, according to Rotten Tomatoes. "It certainly proves that the Chinese film industry can hold its own at the multiplex: It is just as awash in murky computer imagery, stupefying exposition and manipulative sentimentality as the average Hollywood tentpole," said the Times' review. But at Slate, Inkoo Kang writes that the film "understands what American blockbusters are still loath to admit: Responding to climate change will pose infrastructural challenges on a massive order and require drastic measures on a planetary scale. Perhaps it takes a country like China, which is accustomed to a manic rate of construction and grandness of organizational possibility, to seriously consider how dramatically humanity will have to reimagine our ways of life to survive such a catastrophic force."